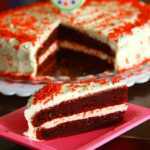 Here is a collection of baking and cooking recipes using red velvet cake mix as one of the ingredients. This page will be updated on regular basis. Making this eggless red velvet cake with cream cheese frosting is very easy because it starts with a store-bought cake mix but tastes like it was made from scratch. The combination of tofu and yogurt as egg substitute works like a charm making the cake very soft and moist.